So you recently purchased a shrub, tree or other plant with the intentions of growing it in a pot or other container. The plant looked fine when you purchased it but within a few days, weeks or months after transplanting it to a larger container you noticed the leaves turning brown and dying, or all the leaves just suddenly fell off the plant. If this has happened to your plant, know that all might not be lost. Maybe you can do something to save it. Without being there to see your plant and assess the environment it's growing in, it's very difficult to provide an accurate diagnosis or remedy. That said, there are a few common causes of stress, damage or death to a new or older plant that is growing in a pot or other type of container. 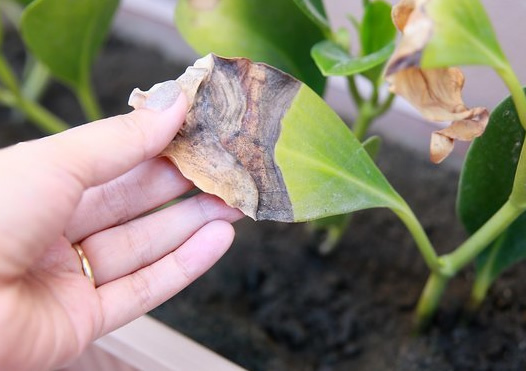 Read on to learn about these causes and effects and possible remedies to restore a sickly potted plant to health. With the exception of aquatic plants, which prefer a constantly soggy soil, and cactus and other succulents, which prefer a drier soil, most shrubs, trees and other plants prefer a moist but well-drained soil when growing in a container. Constantly soggy or overly dry soil can be problematic, causing serious harm or damage to these plants. Note: When growing a plant in containers it's helpful to know the plant's moisture needs. When there's too much water constantly around the roots of a plant that likes a moist or dry but well-drained soil the roots will eventually start to rot. The first indicator of root rot is usually browning or blackening leaf tips. Eventually leaves will die back completely and fall from the plant. When the soil has become too dry a plant that prefers a moist soil will often shed most or all of its leaves all at once. So it's a good idea when growing plants in containers to monitor soil moisture. 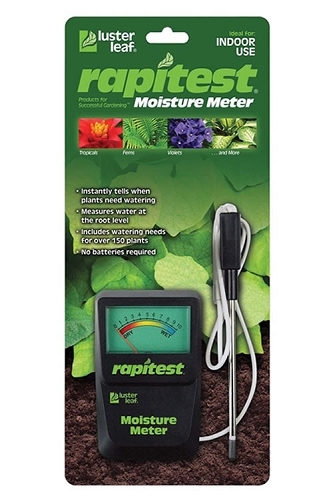 The best way to check soil moisture is with your finger or a moisture meter. Check to a depth in the soil of at least 4 inches. If it's a new plant that has yet to develop new roots you can lift the plant and its root ball from the soil. If the soil is soggy wet when checked the first thing to do is check to make sure the container has a drainage hole at the bottom that is working properly to allow excess water to drain from the soil. If there's no drainage hole drill one or more holes at least 1/2-inch in diameter. I usually drill no more than 3 holes, and that's for larger containers with a bottom diameter over 15 inches in diameter. If the soil is too dry when checked you'll have to provide water more frequently or replant with a soil media that retains more moisture. Sometimes applying a 1/2 to 1-inch layer of mulch as a soil cover will help to conserve moisture. When water properly drains from a container it's difficult to over-water because excess water will usually drain sufficiently to prevent a constantly soggy soil. That said, if the soil media used in the pot is too heavy or dense, or too loose, the soil itself will hold too much or too little water. Regarding new plants, during the first few weeks after planting, check soil moisture often and only provide water if necessary. Rather than just splash a little water on plants every day, it's best to allow the soil to dry out somewhat before providing more water. At that time deep soak the soil until water begins to drain from the drainage hole(s). Needless to say, you don;t want to allow the soil to dry so much that the leaves of your plant become severely wilted. A little wilting is okay and a good indicator that it's time to water. The type of soil you use in a container garden will depend on the moisture needs of the plant. Cactus and other succulents prefer a light, rocky or sandy soil that drains quickly. Aquatic or bog plants prefer a heavier soil that retains a lot of water. Plants that prefer a moist but well-drained soil usually do well in a soil that holds moisture evenly; not too wet, not too dry. Important Note: With the exception of aquatic plants growing in containers submerged under water, avoid the use of native soil/dirt dug from your yard in container plantings. Reason being, native soils are often too dense and hold too much water. When planting shrubs, trees or other plants that require a moist but well-drained soil in a pot or other container, I usually use a 50/50 blend of bagged potting soil and bagged potting mix. There is a difference between these two types of soil media. Potting soil is a heavier soil that usually contains wood bark fines, sand, and maybe a small amount of composted organic matter such as cow manure. Potting mix is a lighter media that might contain some bark matter but also contains peat moss and other light ingredients that help to hold moisture more evenly from top to bottom of a container. You might also consider adding some pumis at a ratio of 10 to 20% or so to your soil mixture. Pumice is an excellent soil conditioner, as it is highly porous providing excellent water, air, and nutrient holding capabilities. Pumice will not decompose or compact over time and is very lightweight. Agricultural grade pumice can usually be found at local feed stores as a product called Dry Stall. The particle size is about 1/8". It's a good idea to wash the product before use to remove the fine particles. If you can't find Pumice you can substitute with perlite. Extra Tip: When planting in a container, before filling your container with soil mix, I recommend lining the bottom with shade cloth or a porous landscape fabric. This will keep the drain holes from becoming stopped up with soil. If you place gravel, stones or other materials in the bottom of your pot lay the fabric on top of it. It goes without saying that if a plant that prefers and thrives on plenty of direct sunlight is situated in a dark, shady environment it will often suffer. Likewise with a shade-loving plant situated where it receives too much direct sunlight, especially during the afternoon hours. Know the sunlight preferences and needs of your plant. You'll find sunlight preferences under the description tab on every plant page in this website. Radical temperature changes can cause plants to shock, especially during the seasonal transitions from winter to spring and fall to winter. If you order a plant online from a nursery it's a good idea to know where the plant is coming from. For example, if you're in Texas and experiencing a major heat wave with temperatures above 110 F, and you're wanting to order a plant online that will be shipped from a location where the temperatures are 80 F, it might be a good idea to schedule delivery for a time when the heat wave has ended and temperatures have gone back to normal. If it's April and you're up North with light snow on the ground, you might want to wait until temperatures have warmed and all chances of frost have passed before scheduling a delivery of plants from a nursery in the South where, by April, most plants have emerged from dormancy and are full of fresh, tender new growth that can be damaged by cold temperatures. Too much or the wrong fertilizer can cause serious problems with plants growing in pots or other containers. Before applying a fertilizer, make sure to check the product label to see if it's listed for use on potted plants and that it can be used on the type of plant you're wanting to fertilize. Then carefully follow application instructions on the product label to ensure you apply the right amount of fertilizer. . If you've already applied too much or the wrong fertilizer you can flush it out of the soil. Simply place the end of a garden hose on top of the soil and run water slowly until water has drained from the bottom of the pot for a few minutes. Repeat this process again an hour later. Some types of plants just aren't happy growing, or trying to grow, inside the home. Unlike many tropical plants, which are happy growing inside the home provided they receive the right amount of sunlight and moisture, many ornamental shrubs and trees prefer life in the great outdoors. Their health might decline slowly or rapidly when inside the climate controlled environment of a home, where there might not be sufficient light, humidity, seasonal temperature changes, etc.. That said, many ornamental plants will survive short periods of time in an indoor environment. Many gardeners in cooler climates will move potted plants indoors that aren't reliably winter hardy in their area. As plants growing in containers mature, their developing roots eventually will run out of space and adequate soil to continue growing. When this happens, we often say that the plant has become “root-bound” or "pot-bound" in its container. Sometimes this is evidenced by roots growing out the bottom hole(s) or over the top edges of the container. 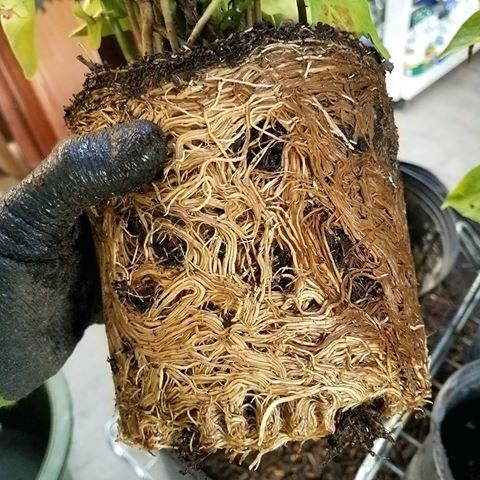 Inside the container, the roots have grown in circles around the sides of the container and have become so dense that there's little room left for soil to hold water or nutrients. When this happens plant growth is stunted or ceases entirely, eventually ending in serious disease or death of the plant. When a plant has become root-bound, the best and easiest thing to do is repot the plant to a larger container using the appropriate soil that meets the moisture needs of your plant. If the roots are bound it'll be necessary to use your hand or a claw tool loosen or break the roots up a bit, "teasing" them around the surface of the root ball. If the roots are so heavily bound at the bottom of the root ball that they can't be loosened, use a hand saw to remove several inches of root mass. Since you'd be removing some roots that feed the plant parts above the soil line, it would be a good idea to give the plant a light shearing or pruning at this time. When ready to replant, follow the instructions found here. If your plant is root-bound in its container and you don't want to repot to a larger container or transplant to the landscape, you might try root pruning. This technique is used frequently by those who practice the art of Bonsai. Some plants are more sensitive to having their roots disturbed, so it’s a good idea to look up specific instructions before root pruning houseplants and other ornamentals. Rather than go into details about root pruning here I suggest you do a Google search to seek the advice of an expert in this form of pruning. Any time parts of a plant have died it will be necessary to remove these dead plant parts. When removing a dead branch or stem make your cut just below the point of dead growth, preferably just above a live bud. At planting time, when planting a new container garden or after repotting an older plant to a larger pot, it's beneficial to apply Root Stimulator as an extra boost to reduce plant shock and promote greener, more vigorous plants by stimulating early root formation and stronger root development. Hope this info was helpful. If you need more details or have any questions don't hesitate to contact us.